Antoine Griezmann’s goal has given Atletico Madrid an early 2-0 lead after an own goal from Monaco in the opening stages of tonight’s Champions League game. It looks like being a long night for Thierry Henry’s side, with the Arsenal legend’s struggles since taking over from Leonardo Jardim continuing this evening. Watch the Griezmann goal video below as the France international scores a delightfully cheeky effort with the outside of his boot after finding space in the box. 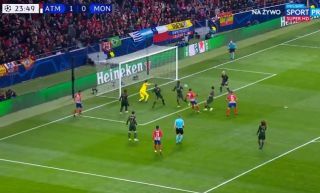 It’s quality like this that makes the Atletico front-man one of the best in the world, and a valuable asset to Diego Simeone as he bids to reach a third Champions League final after twice losing against Real Madrid in the competition.